The Arden Macaulay redevelopment project in Melbourne aims to transform the precinct into one of the best examples of urban regeneration internationally. The precinct is generally underutilised, is highly urbanised, and has a challenging flooding and drainage management catchment. Addressing drainage and flooding will be crucial to the long-term viability of the development precinct, especially when long-term changes to climate are factored in. This report from the Cooperative Research Centre for Water Sensitive Cities (CRCWSC) is the first step in an iterative design process and presents the findings of 18 months of research. It outlines four innovative approaches to drainage and flood management that could be implemented in this precinct. These transformative concepts, which have been generated from the Arden Macaulay Design Investigation, explore how underlying landscapes could inform development scenarios and building design by prioritising water as a driver of city form. 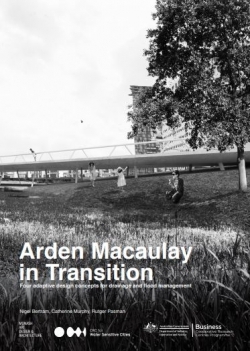 In these proposals Arden Macaulay emerges over time as a resilient, adaptable and liveable place that can deal with future impacts, such as high levels of intensification and the changing water conditions created by climate change.